A link to "Manage Hunt Group settings for VoiceEdge Select (video)" will be sent via email. Your link to 'Manage Hunt Group settings for VoiceEdge Select (video)' has been sent! A Hunt Group directs an incoming call to an assigned group of users, allowing an available user to answer the call if other lines are busy. VoiceEdge Select offers up to four Hunt Groups with regular and simultaneous ring pattern options. A regular (or sequential) ring pattern rings phone numbers individually in a specific order until the call is answered or the end of the list is reached, at which point the call goes to the dialed number's voicemail. 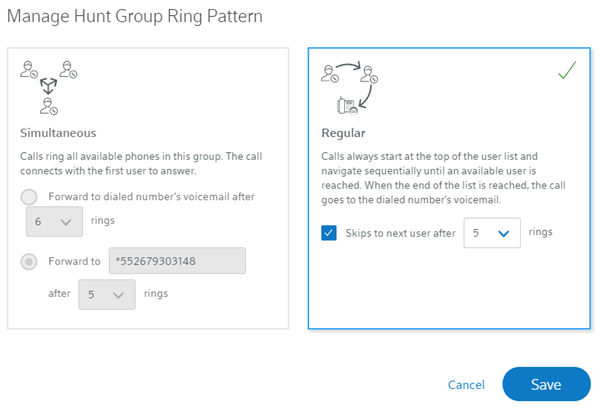 A simultaneous ring pattern allows an incoming call to ring in unison across an assigned group of phone numbers. After a defined number of rings, an unanswered call can go to the dialed number's voicemail, a specific user's voicemail, or any phone number. Note: This feature may not be available in all areas. Note: This feature may not be available in all areas. The following content is only applicable to VoiceEdge Select customers. If you are a Business Voice customer, please refer to Manage Hunt Group settings online. If you are a Business VoiceEdge customer, please refer to Edit your Hunt Group settings for Business VoiceEdge. Note: Only a Primary Manager can edit Hunt Group settings. Expand the Account menu and select Hunt Groups. In the Basic settings section, select Edit to enter a Hunt Group name and select a Time zone. 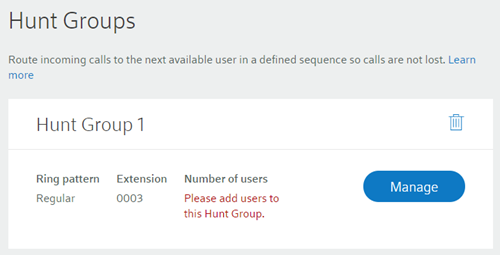 Select Edit Users to assign users to a Hunt Group. Check the users and select Assign user(s), then Save. In the Call flow settings section, select Change ring pattern. Select one of the two ring pattern options, Simultaneous or Regular. To send to the voicemail of the dialed number, select Forward to dialed number's voicemail after and then select the number of rings. To send to a voicemail other than that of the dialed number, select Forward to, enter *55 plus the extension and select the number of rings. The first directory number in the Hunt Group displays in the Forward to field by default. To send to any phone number (a home or cell number, for example), select Forward to, enter the 10-digit number and select the number of rings. 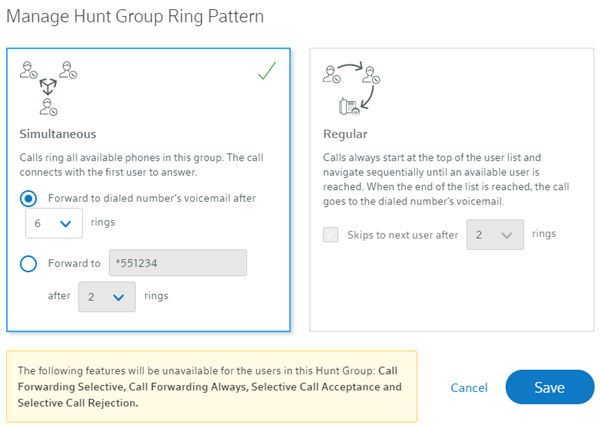 To set the number of rings before the call is passed to the next user in the Hunt Group, check Skips to next user after and select the number of rings. 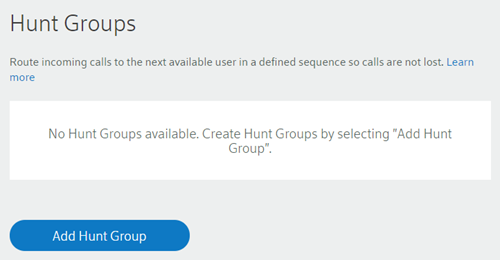 Toggle the Hunt on any user and Group busy options on or off, as appropriate. For a regular ring pattern: when Hunt on any user is on, calls are routed to the next available user when any user is called. When Hunt on any user is off, calls are routed to the next available user only if the first assigned user is called. For a simultaneous ring pattern: when Hunt on any user is on, calls to any assigned user will enable the simultaneous ring Hunt Group. 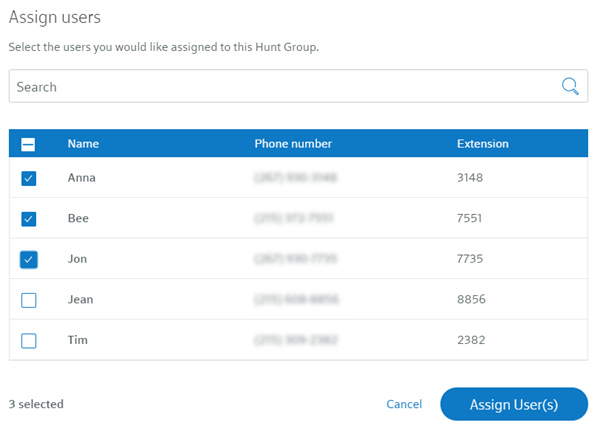 When Hunt on any user is off, only calls to the first assigned user will enable the simultaneous ring Hunt Group. When Group busy is on, calls are routed to the dialed number's voicemail or Call Forwarding Busy destination. VoiceEdge Select is a cloud-based phone system that helps you run your business more efficiently. Learn how to manage your Automated Attendant settings for your VoiceEdge Select service.